Today, the GSA Morgan Dollar Coin reports the silver news of 122 years ago. When the skillful mariner sees in the distance the surface of the sea lashed into foam by the fury of the approaching storm, he does not notify the ship’s crew that he will prepare for it after awhile, the next hour, or the next day, or a week hence, but he promptly calls all hands to quarters, and shortens sail and makes everything snug for the blow that is coming. He does not wait for the sails and rigging to be blown into shreds, and for the ship to be thrown on her beam ends in order to give his crew an object-lesson before he proceeds to care for the interests of those to whom the ship and cargo belong, but he saves the ship first and does his teaching afterwards. Mr. Cleveland is the mariner who was chosen last November to navigate the ship of state, and the Democratic majority in the Fifty-third Congress make up his crew. Had he called Congress together immediately after his inauguration, and had Congress done what was made obviously necessary by the situation, there would have been no financial nor industrial depression. It is even possible there would have been no trouble of a serious character had not the administration in its first financial manifesto cast a doubt upon the relative value of the different kinds of currency. This was a blunder which could only be repaired by an official announcement from Congress of the policy of the government, and Congress ought to have been called in extra session at once.. The necessity was urgent and evident to all intelligent business men. Distrust, the seeds of which had been sown by the unfortunate announcement from the Treasury, had stirred up the storm, and the action of Congress alone could allay it, but the President wanted to give an object lesson to his crew and the interests of the people were held in abeyance. Congress, or rather the Democratic majority in that body, must be given lessons in the science of navigation by the captain of the vessel at the expense of the owners of the ship and cargo. But while this educational scheme has been in progress, another and a more portentous storm has been hastening over the waves. The suspension of silver coinage in India is ruffling the waters immensely, and yet the mariner declines to heed it. The silver dollar was worth less than fifty-three cents yesterday, or, to be precise, it was worth just fifty-two and ninety-seven hundredths cents. Those who thought it might possibly go as low as fifty cents have revised their surmises, and now admit that it may go much lower. Does the president still persist in prolonging his object-lesson until September? Are the ship and cargo to be subjected to this new peril in order to educate the Democratic majority in Congress? Does he suppose that the people will continue to receive silver dollars at par which are worth fifty-two cents in silver coin, while the administration is finishing up its preparatory course of instruction? This is a very serious question, and it is an intensely interesting one at this juncture. The credit of the government, or, rather, of the nation, is excellent—better than that of any other country on earth—but not even such credit can long avail against the inexorable logic of the situation, and in the moment when the people refuse silver dollars, gold will go to a premium and be hoarded in every part of the land. This can be averted by calling an extra session of Congress at once, and giving the country and the world the assurance that the government’s financial policy is sound to the core. 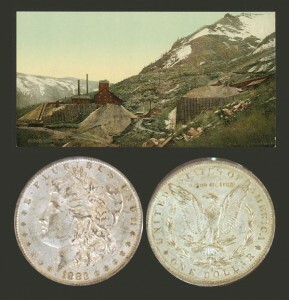 The GSA Morgan Silver Dollar Coin shows below an Aspen, Colorado silver mining operation, circa 1898.